It’s October. It’s colder, it’s crisper, it’s wetter and the evenings are darker. 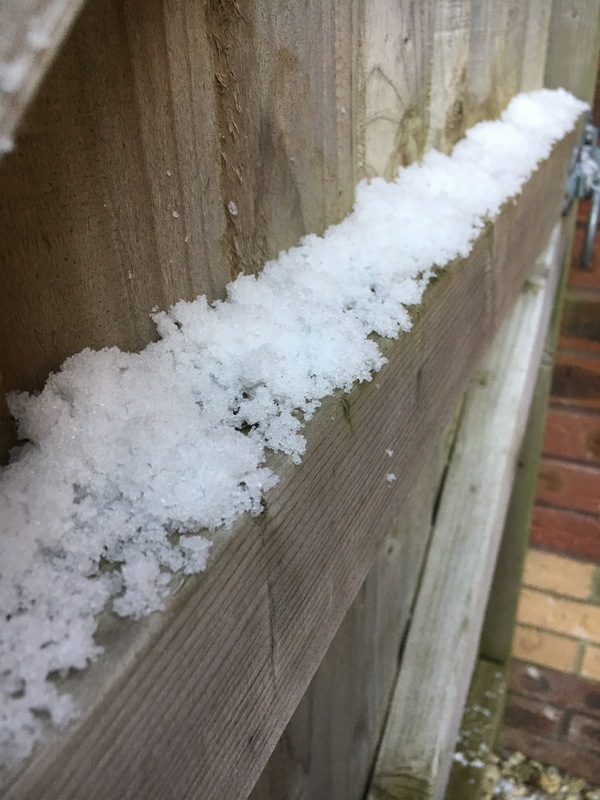 Playing outside becomes trickier as the weather is becoming more unpredictable and finding activities to do with the kids becomes a bit more of a challenge. However, all is not lost! 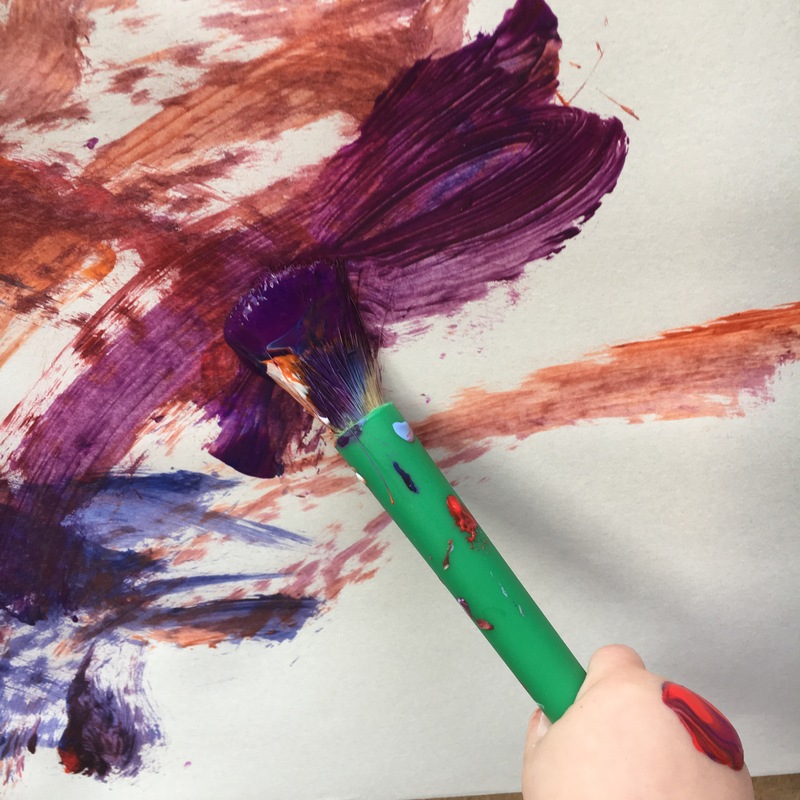 Painting is one activity that is easy to set up, requires little adult input (although supervision is always advised) and can be done both inside or out! 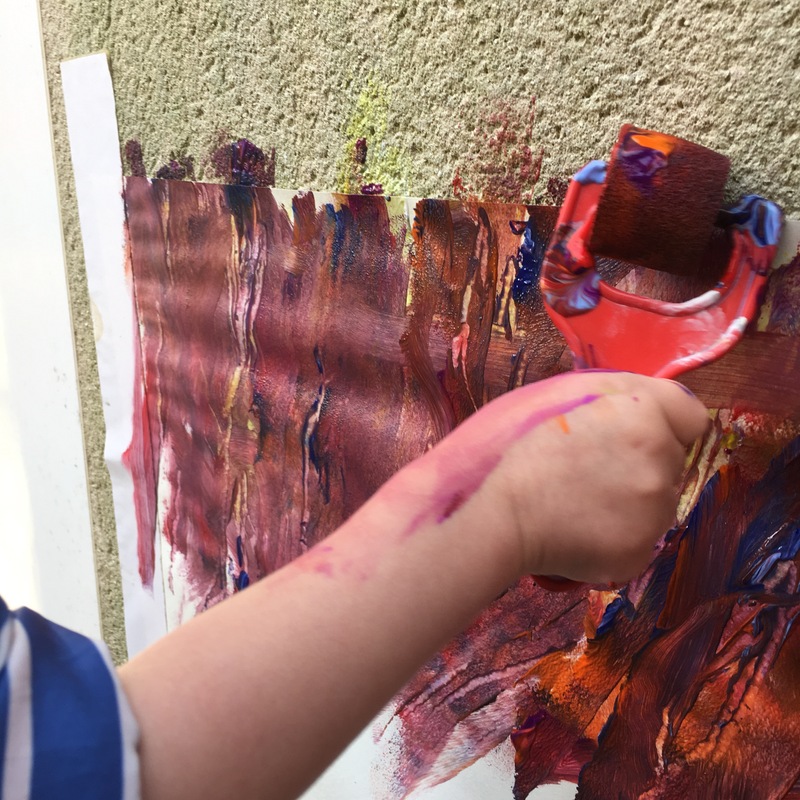 Especially if you don’t want a huge clean up afterwards, why not tape a piece of large paper (or an old wallpaper cutoff) to an outside wall and let the kids create a masterpiece out there instead? That’s exactly what we did this week. I wrapped the kids up in their old coats (new clothing not recommended for this) let them choose their colours and let them loose on the paper. Whilst my 17 month old was quite happy with a chubby brush, as it the chunky smooth handle allows her to have a good grip and hold on it, my 3 year old was a little more adventurous with some foam rollers. 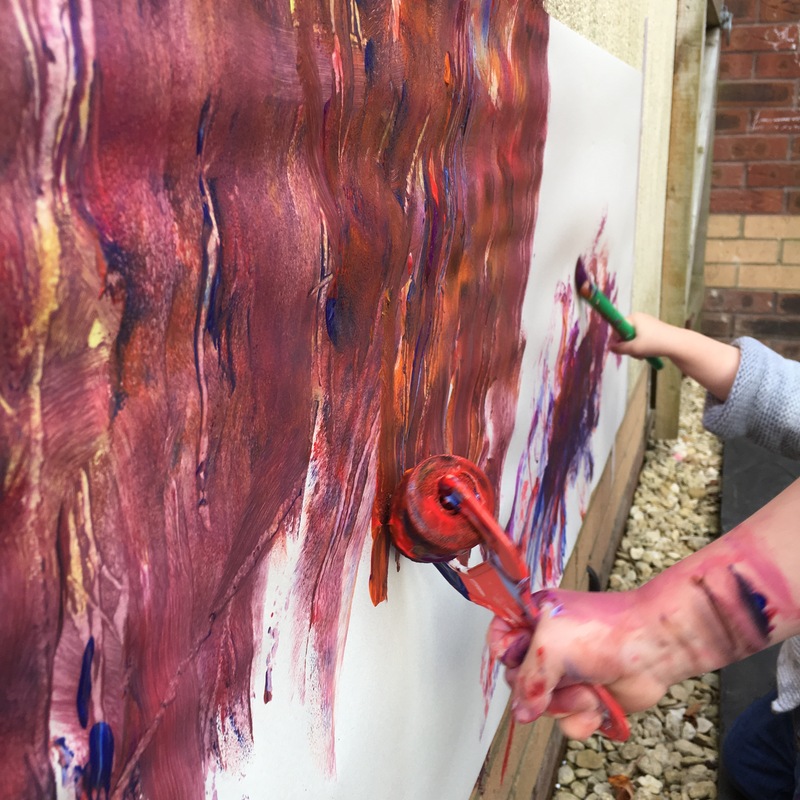 He loves the effect they give as they glide across the paper and best of all, each roller gives a different effect or pattern so there are endless opportunities for fun and discovery. The effects from both are fantastic and both kids were really happy with their art. They spent about 45 minutes on their work and I have to say that it looked brilliant when it was finished. I’d highly recommend these products as ‘on hand’ items to pull out when needed at the last minute. This activity wasn’t planned, but I’m so glad that they had the opportunity to complete a piece of collaborative art together. I will definitely be doing this again in the future, perhaps on a canvas that they can keep forever. 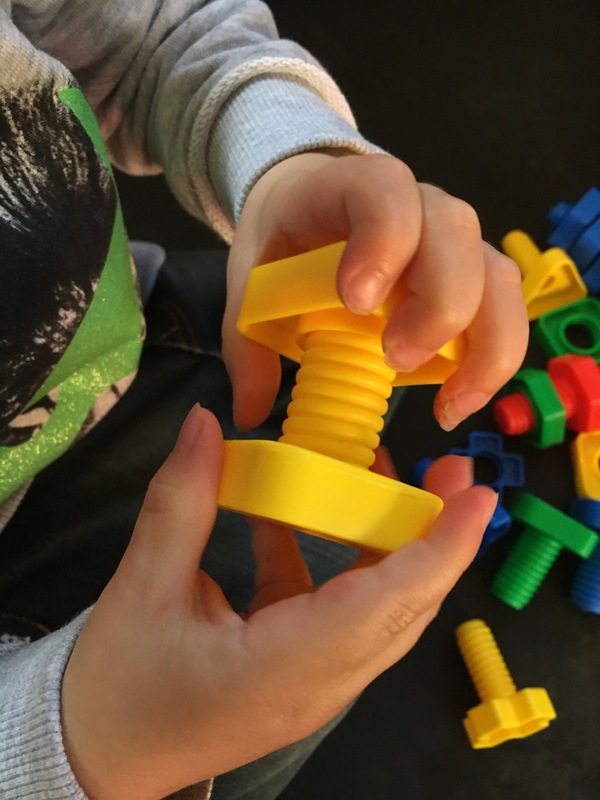 One of the brilliant products we sell for toddlers, pre-schoolers and early years children are our plastic nuts and bolts sets. 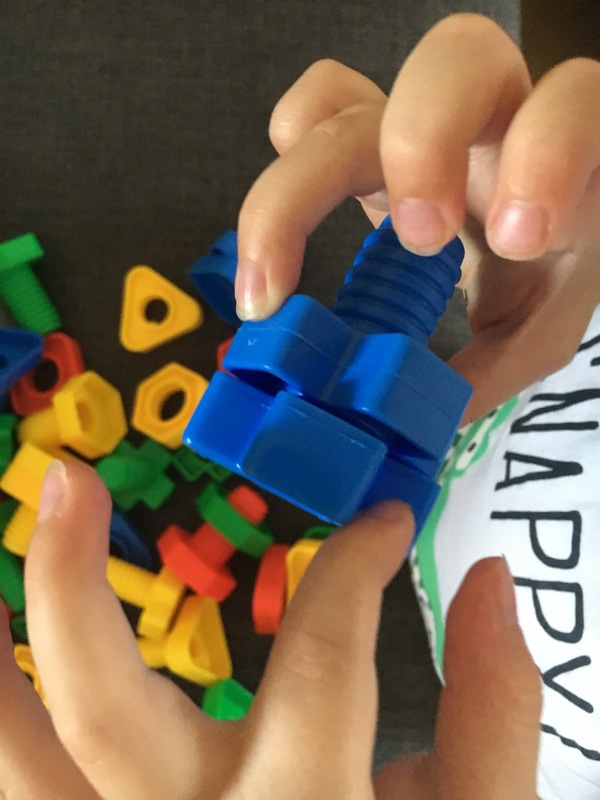 The packs are available in 2 sizes and they’re fantastic for developing fine motor skills and hand strength, both essential aspects that help them get for writing when they’re older. 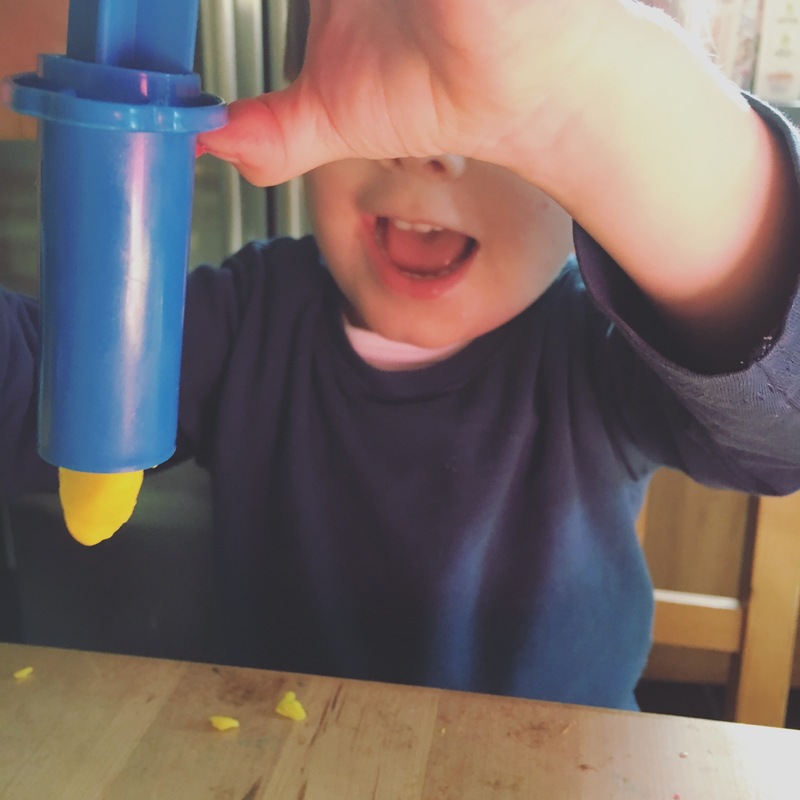 So who better to put the product to the test than my 3 year old pre-school age boy? I laid the contents of the tub out on our tuff spot and he knew exactly what to do with the pieces immediately, without any direction or explanation. 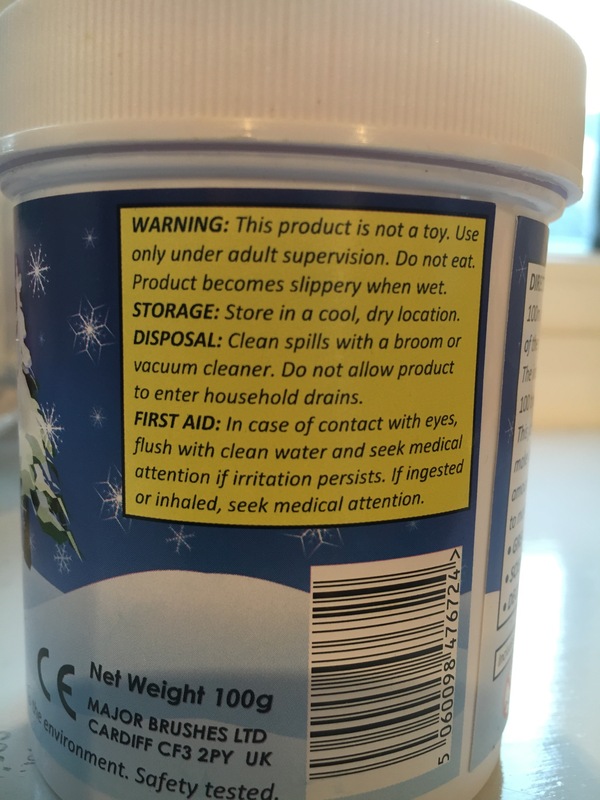 That’s one of the great things about this product. He quickly realised that there are 2 sizes of nut and bolt within the pack, so finding the right sized pair is the first challenge. It takes quite a lot of skill and practise to position their hands correctly, position the bolt within the nut and then turn the bolt the right way to go through the nut. But with a little bit of time they will become quite skilled quite quickly. 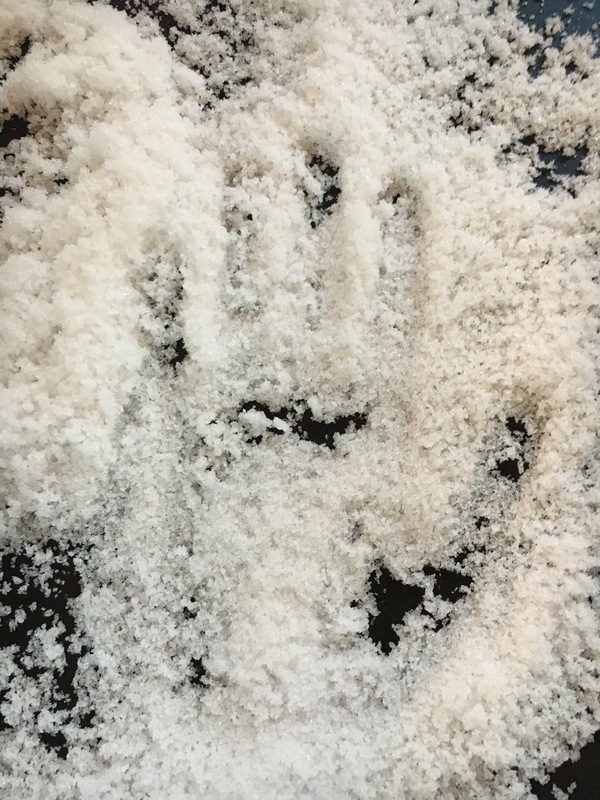 This activity is great for keeping hands busy for a while. My 3 year old spent a good 20 minutes experimenting with the different sizes, exploring which ones fitted which, making sure they were screwed in all the way so that the shapes met and expertly spinning the bolt until they were tight. He loved the excitement of a new challenge! 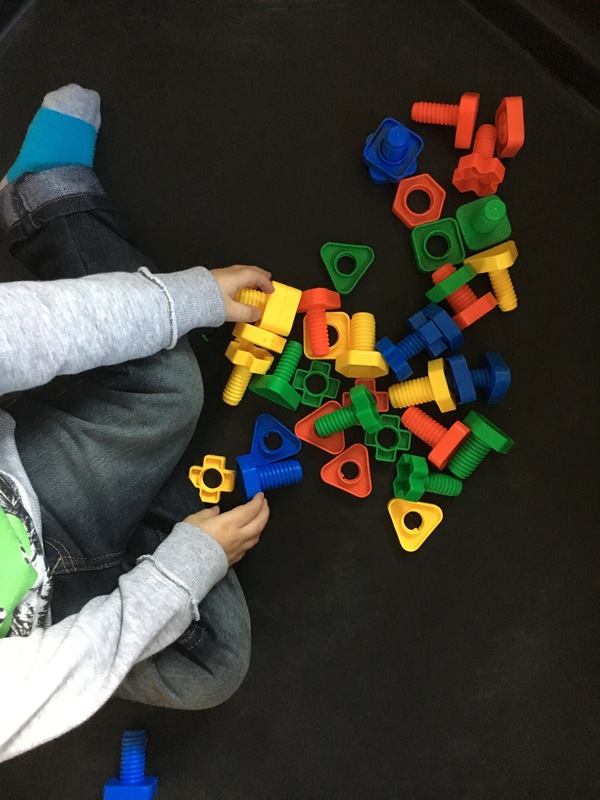 Not only are these good for strengthening hands, but they allow the opportunity for discussing colours, as the colours don’t necessarily need to match up; but also discussing shape, size, ordering, patterns and sequencing. 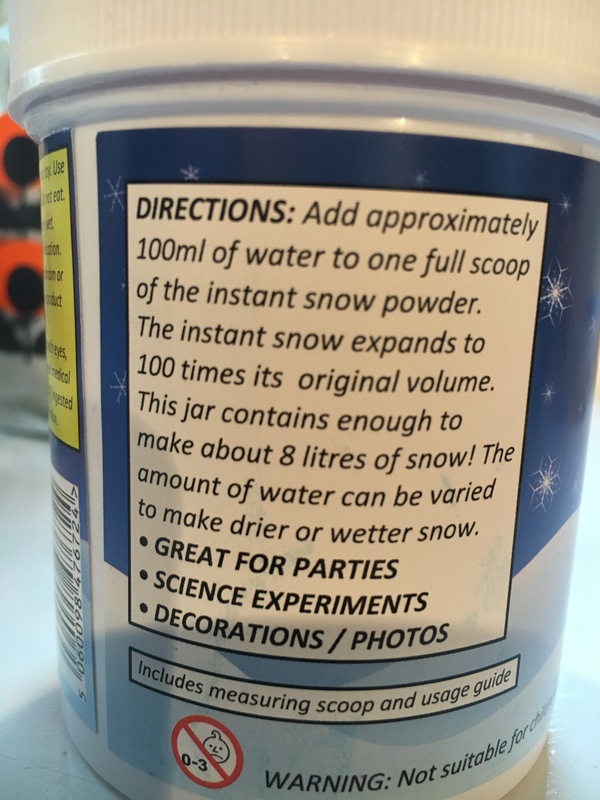 There are so many maths opportunities in one tub! 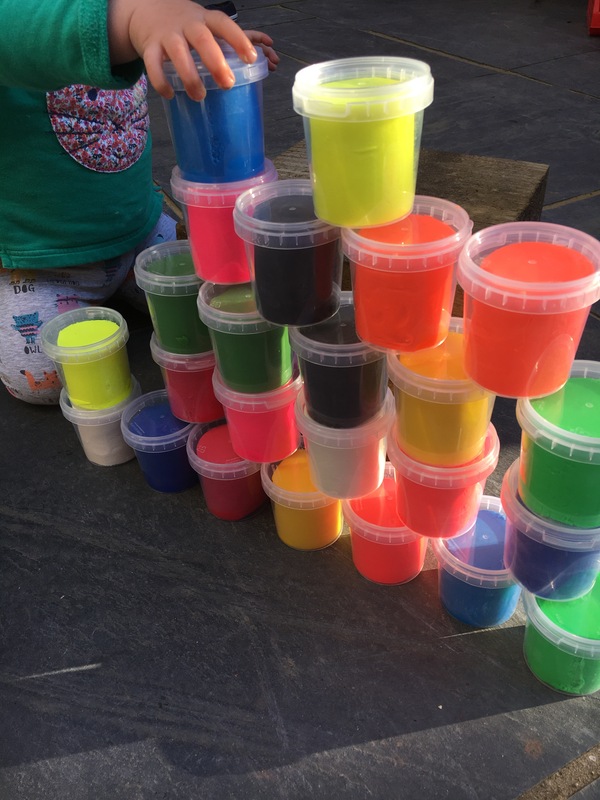 They would also be fantastic for role play areas and building yards both inside and outside, as they are made of thick, strong plastic that will last. I’d highly recommend these as an activity for any setting. And at just £7.19 for a pack of 40, they’re a bargain! 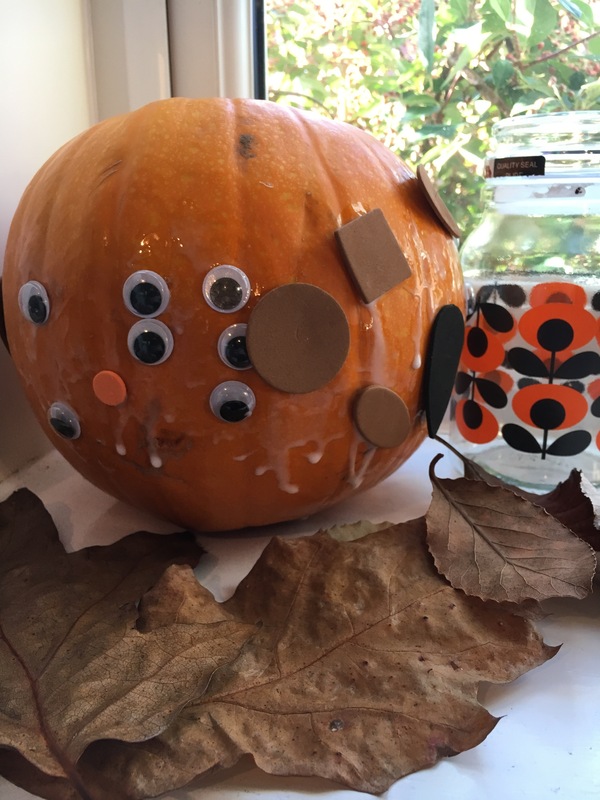 One of the best ways to get younger children involved is to get them to decorate a pumpkin instead. Again, there are many ways that this can be achieved, such as using paint, glitter or even stencils. Today, we kept things simple with foam shapes and wiggly eyes. We bought smaller pumpkins at the supermarket, as I knew my two wouldn’t need huge ones and I layed everything out on the table for them to choose. The set up was quick and easy. My 3 year old went to town on his pumpkin. He absolutely adored slathering on the glue and then covering it with the craft materials. 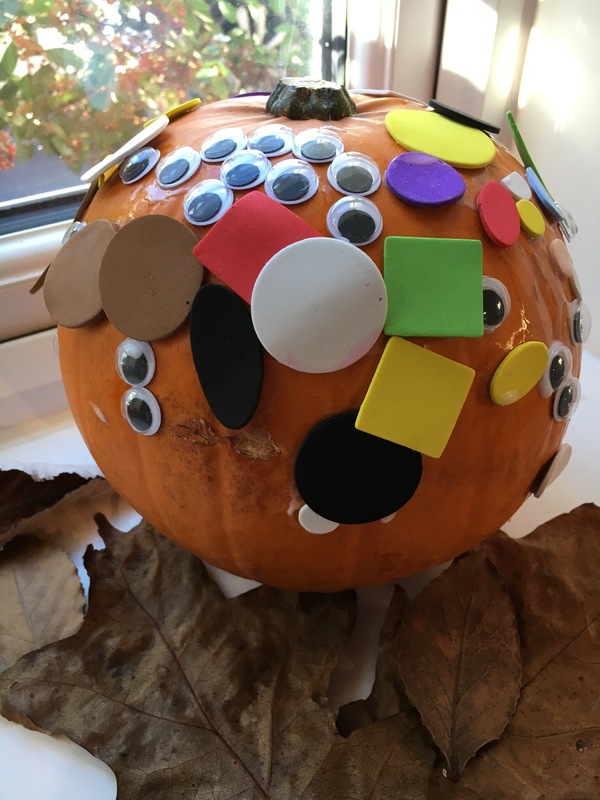 He spent a good 15 minutes carefully placing each shape on the orange surface and he was, quite rightly, very proud of the results. 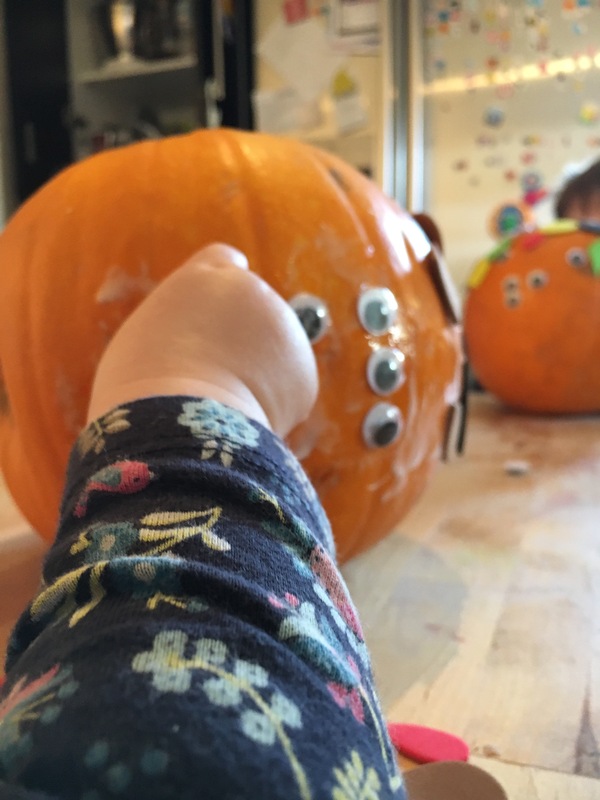 Even my 16 month old got involved and, although she wasn’t able to spread the glue in herself, she was able to practice her pincer grip to pick up the small objects before placing them carefully on the pumkin. She really enjoyed the task and, although she didn’t take as much pride in it as her brother, she seemed satisfied that she’d done something a little bit different to our normal are art craft activities. The finished results are very effective and I would highly recommend this activity for younger children. It gets them excited about Halloween without having the mess and dangerous tools that come with pumpkin carving. Obviously, as with all our activities, adult supervision is required at all times. 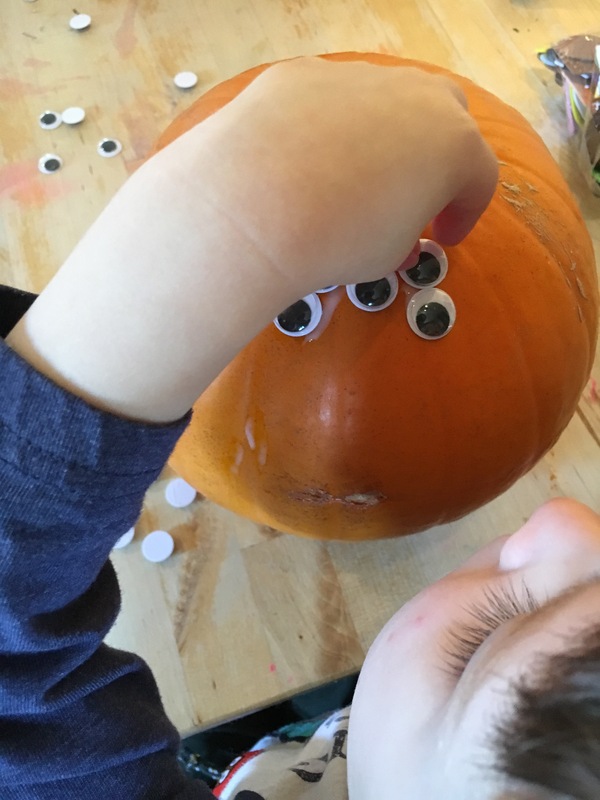 Googly eyes can easily be swallowed and glue could find itself in a toddlers mouth. With the benefits of this activity in mind, I set my three year old boy off on a play mission with dough. We used a few colours out of the ‘Pots of Coloured Dough’ pack (link below). The great thing about these is that they are soft, easy to use and they don’t stain! Each colour is also provided in its own air tight tub, so you don’t necessarily have to use all colours all at once. You can pick and choose. So my boy chose red and yellow before setting off on a series of manipulation and creating with the dough. After rolling the dough out flat and poking holes in it with his fingers, he used a wheel cutter to slice the dough into strips. I then helped him roll the strips into sausages to put into our dough guns. 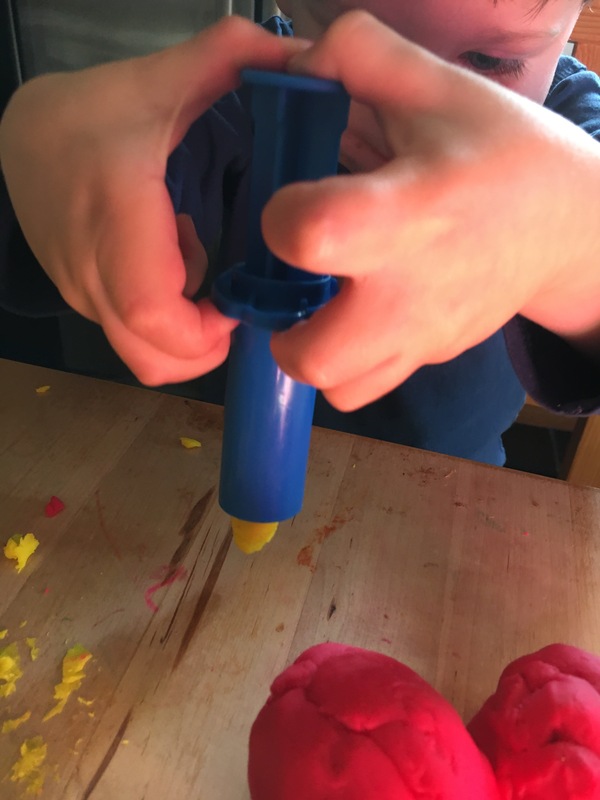 It took quite a lot of effort on his part to squeeze the dough through the gun, however, he persevered and just adored the results! I’d say that a little adult help is needed here if your child is very young, but allowing them to try themselves as much as they can will only help their hands strengthen in the long run. It was only at the end that I stepped in for him and he then enjoyed ‘catching’ the dough as it came out through the shaped holes. 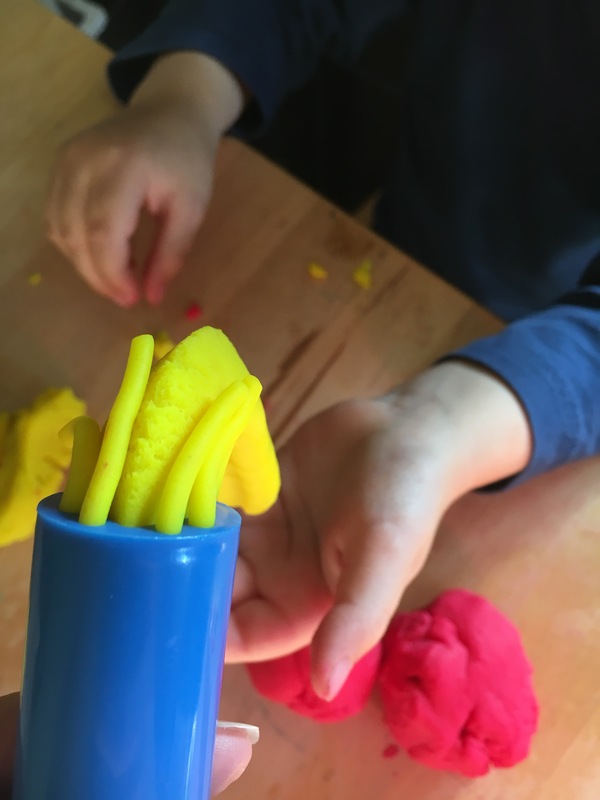 These dough guns are brilliant for exploring dough in a different and original way. They come in a pack of 5 and each gun has a different shaped hole at the end, meaning that the dough comes out a different shape. Children can have so much fun trying the different variations. After initially playing fairly randomly, my little boy decided that he wanted to make the dough into a man. 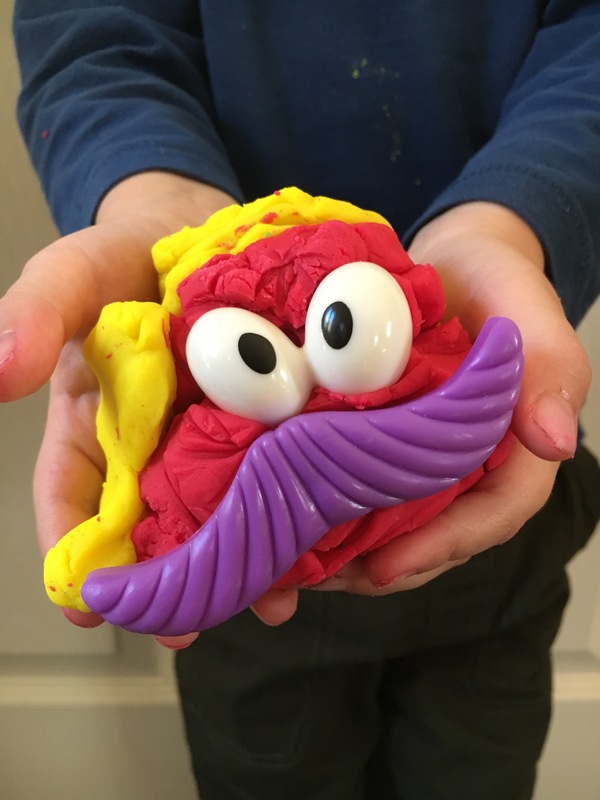 Luckily, we already had some dough accessory sets at home, so he chose the eyes and a moustache from that. He starting by squishing the dough together to make a head, then carefully pushed the facial features in. All in all throughout his play he rolled, poked, squashed, pushed, pulled and pinched whilst creating and experimenting. He loved it! It can be a bit of a challenge getting the dough out of the pot. Sometimes it needed a little bit of encouragement, however, this is a great problem solving skill and it all helps towards strengthening those fingers! 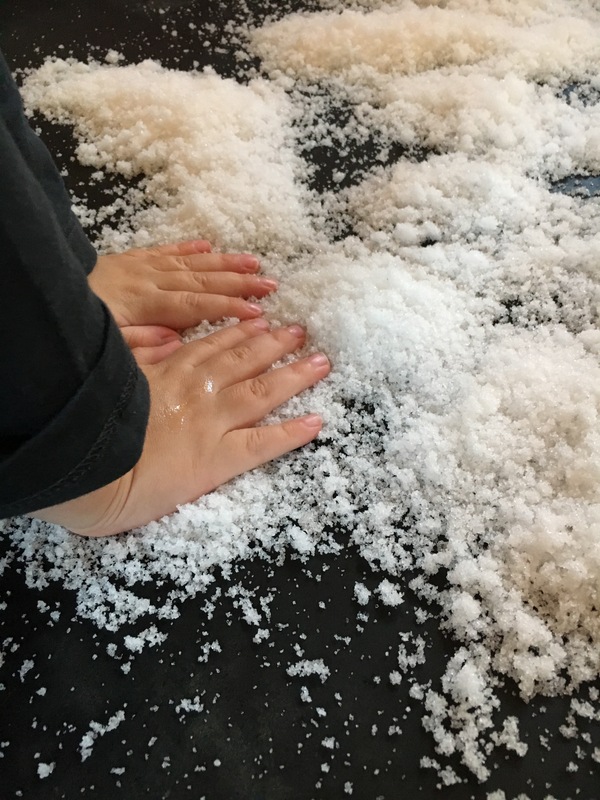 I would highly recommend Dough as an activity for children 3+ as, not only does it help eliminate boredom on rainy days or days at home, but it’s quick to set up, there’s little mess and the opportunities for play truly are endless! Not to mention the benefits of strengthening little hands and fingers through manipulation without even realising it! My 1.5 year old even wanted to get involved. However, a word of warning, adult supervision is always advised in such activities as Dough could easily be swallowed. Hello there! Thank you for clicking on our blog. We’re so happy that you did. So, today is the day that our main website, firsthandschoolresources.co.uk went live. And I can’t begin to tell you how exciting that is. The website has been months in the making. Our business was born in March 2016 as an initial idea and big dream. Since then, a catalogue has been developed, products sourced and ordered and the website developed (after deciding to change hosts and having to start again) plus all the other bits and bobs that come with setting up a new business, all behind the scenes. It’s been hard work. Very hard work. Looking after 2 young children under 3, working part time and trying to build up a business has meant that life has been challenging at times. So to be able to finally show the world the results of all that hard work is such a pleasure and relief! This blog has been set up to work alongside our main website. Here we’ll post product updates and things to expect, plus ideas and activities for you to try at home once you’ve bought some of our lovely things. We look forward to posting ideas very soon so please check back and join in. 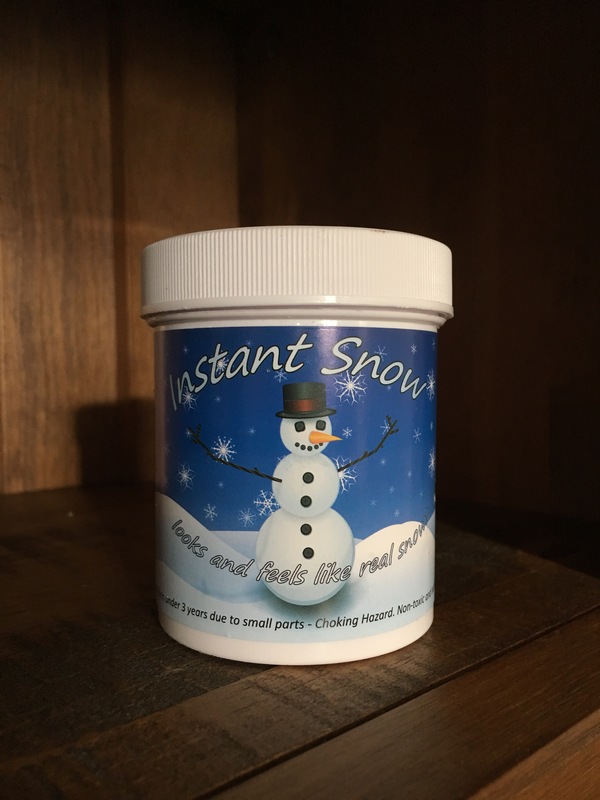 In the meantime, pop over to the website to have a nose at our range. We’d love to know your thoughts!